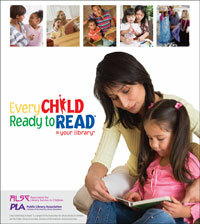 The ECRR second edition toolkit resources enable public libraries and other early literacy centers to present workshops that help prepare parents/caregivers for their critical role as their child’s first teacher. The workshops demonstrate how parents, grandparents, childcare providers, and preschool teachers can use five simple research-based practices—talking, singing, reading, writing, and playing—to develop language and pre-reading skills in children from birth to age five. Based on research and feedback from the original ECRR program, the second edition continues to focus on the parent/caregiver as well as on community partnerships and outreach efforts. In addition, there are several key enhancements, including more workshops (8), fluid talking points versus scripts, and customizable PowerPoints.